"Great pace and great conversation" said the smiling guy at the finish line when my friend and I crossed it, tied for third place in the women's division. He had trailed us for some portion of the race and finally passed us on the downhill, laughing at us for chatting our way through 102 minutes, 13.1 miles and 2,800 vertical feet. Sure, on the downside, I had huffed and puffed my way up the hill while trying to maintain and verbalize a coherent thought and not lose the poorly constructed breakfast I had eaten too fast, too late. But on the major upside, the conversation engaged me so much that the miles sped by and I even forgot to wallow in my usual miles 10 to12 slump. 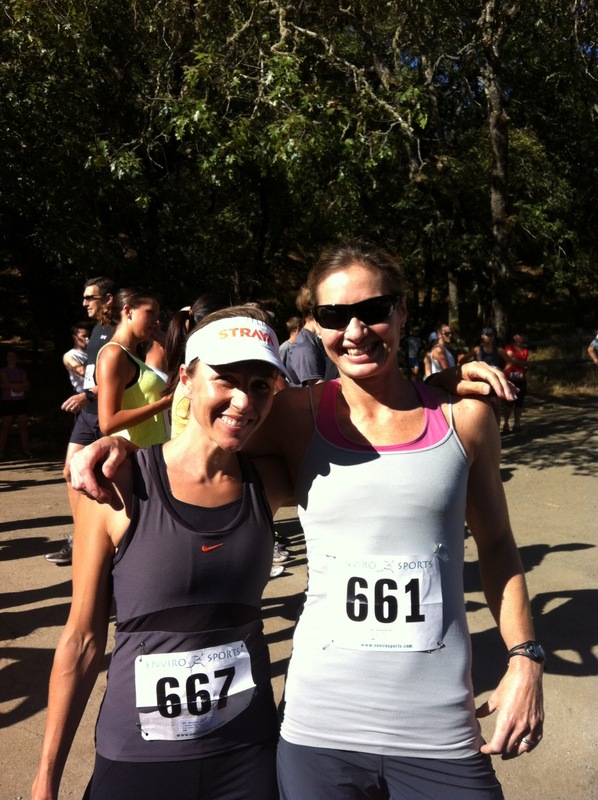 That is the beauty (and fun) of running on an amazing trail system, in a beautiful place, with an inspiring friend. Apparently. For the record, I am usually not much of a talker, especially in races. In life too, I would much rather do than discuss. However, two things have changed that part of me pretty drastically in recent years, namely a five year old girl and a two year old boy. From the moment I became pregnant six years ago, suddenly all I wanted to do was talk about being pregnant with other pregnant women. Then after nine months of that, and ever since then, all I want to do is talk to other people about what it is like for them to be parents and spouses and individuals. That is fundamentally why I started this blog exactly 61 posts and 6 months ago - to continue that conversation on a regular basis. I personally can't get enough of exploring and learning about what it means to be a parent-and-then-some these days. It has been fascinating to gather the perspectives of those around me in terms of how they are navigating through this time in their lives; It has been inspiring to read what others write on the subjects of parenting and wellness; It has been personally fulfilling to find a creative outlet that I can shoehorn into the rest of my life and that brings me easy happiness. 1. Be Mindful in Your Trade Offs. I have encountered near-universal recognition that "having it all" is not always possible, or even desired. However, what seems to be key is to consciously decide what your trade-offs are going to be - whether it means a less driven career, or less working out, or less time with your family. Rather than let your life run away from you, decide what you are going to keep, and what you are going to let go, and make sure that the balance you strike is something that you are going to be happy with. Many times this will mean saying "no", which is a very uncomfortable word for many of us, but something we need to be okay with if saying "yes" will skew our priorities away from what we have decided is best for ourselves and our families. 2. Take Time to Assess and Recalibrate. At whatever interval is appropriate for you, take the time to take stock of the big picture of your life and re-prioritize your activities/time-allocation, if needed. Some periods are more demanding that others, both on the work side and the life side. Knowing this, it is okay to be flexible with your time-allocation on a week to week, month to month, or year to year basis and temporarily increase the focus on certain elements (e.g., to deal with work deadlines, training for a big race, or major life events), as long as that is done mindfully, and you give yourself the opportunity to recalibrate as needed. 3. Don't be Afraid to Stretch. I am so impressed with the stories of people striving for personal achievement in addition to balancing the multidimensional demands on them. Whether its been to take on a bigger job, modify their diet, run a half-marathon for the first time, climb a 5.13, or run a sub-three hour marathon, these women and men have drawn lines in the sand and carved out something for themselves that has empowered them and inspired those around them. 4. Asking For Help is Okay. In the same way we struggle with saying "no", it can also be hard to ask for help. It shouldn't be though. We should allow ourselves to ask our husbands/wives, family or friends for help, if we need it and not be ashamed (its totally okay to pay for help too). A perfect example was the email my girlfriend wrote last week, accompanied by an adorable picture of her 3-week old son I love this little man more than anything, but mommy needs to get out of the house! Who wants to meet for a drink? We mamas who knew exactly what she was going through met her pronto for that drink. 5. A Healthy Life Has Many Dimensions.When you are thinking of what it means to be a healthy individual and grow a healthy family, there are so many aspects of body, mind and soul nourishment to consider. Rather than get overwhelmed, decide what it is you want to focus on and put your energy there, the rest will follow. Some have told me that when they don't have time to exercise they focus on their eating; Some have started exercising now that they have found a way to build it into their commute; Some have told me they are building a small home gym and having a trainer come over at 9 PM so they can lose those stubborn post-baby pounds; Some have told me that they are trying to simply put some unstructured time into their overly scheduled life. All of this is good. 6. Prioritize Your Self and Your Relationships. At the end of the day, the thing that is going to make your family the happiest is if you are happy. That happiness and self-worth will translate into you being able to be your best self with your children, your partner and your co-workers. Because of that, come hell or high water, you gotta figure out how to make that "me time" happen, in whatever shape or form you need it. This is a journey in terms of defining who we are as parents and spouses and individuals; of figuring out ways to strengthen our bodies and our minds and our families; of trying and failing and succeeding when we get back up again. Thanks to all that have supported me in creating this dialogue, including sitting for interviews, writing guest posts and sending me emails and comments. It is so fun and also so hard to be on this journey of discovery and reinvention and fortitude. Hopefully by being here we all know that we are not out there on our own. beautiful post. couldn't agree more...on like...every single front! thanks for this.